Turn off email and text alerts to avoid interruptions. Check your emails at scheduled times throughout the day. NOT ALL DAY! Limit social media time to 30 minutes per day, preferably after work. Don’t schedule an in person meeting when you can Skype or simply make a phone call. Combine meetings with breakfast, lunch or dinner. Stop multi-tasking. 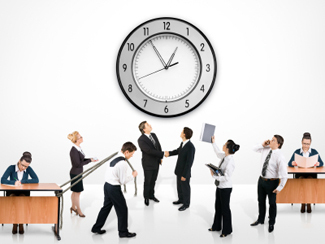 Instead, practice time chunking–focus on a project for 30 minutes without interruption, then take a 5 minute break. Repeat as necessary. Getting a good night’s sleep will help you be more efficient. Check traffic on Google maps before hitting the road–if you see red, pick a different route. Adjust your commute time to off hours so you avoid sitting in traffic.